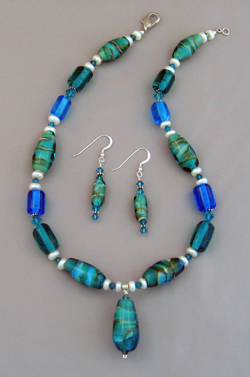 All of my jewelry designs begin with handmade pendants and beads. These provide the inspiration to find just the right gems, beads, and other components to finish the piece. Only the finest components are used. These include semi-precious gemstones, Swarovski crystals, Czech and Japanese glass beads, fresh water pearls, and sterling silver and 14kt gold-fill beads and findings. Pure silver foil and 22kt gold leaf are often used as part of the techniques I use in making beads. When the design is a continuous strand of beads, 21-strand stainless steel wire encased in nylon is used for strength and flexibility. When chain or wire are used as part of the design it will always be sterling silver or 14kt gold-fill. However a piece is designed and whatever components are used, each piece is carefully crafted. The standard I have set for myself demands casual elegance and fine handcraftsmanship in every finished piece. Should you choose to purchase one of my creations, I wish you as much joy in wearing it as I experienced in making it.